Synthetic peptide within Human DDX4/ MVH aa 700 to the C-terminus (C terminal) conjugated to keyhole limpet haemocyanin. The exact sequence is proprietary. Our Abpromise guarantee covers the use of ab13840 in the following tested applications. WB Use a concentration of 1 µg/ml. Detects a band of approximately 76 kDa (predicted molecular weight: 76 kDa).Can be blocked with DDX4 / MVH peptide (ab13841). ab13840 at 1/1000 staining germ cells of the embryonic mouse testis by ICC/IF. Cells were PFA fixed and permeabilized in 1% Triton X in PBS prior to blocking in 5% serum for 2 hours at 20°C. An Alexa Fluor® 488 conjugated goat anti-rabbit antibody was used as the secondary. 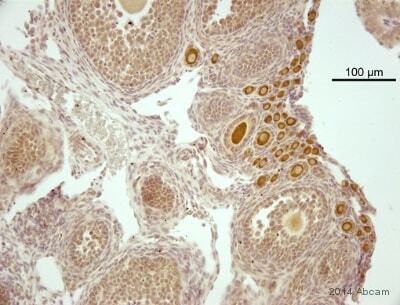 Ab13840 at 1/400 staining mouse fetal testis tissue sections by IHC-P. The tissue was blocked with both BSA and serum and fixed prior to incubation with the antibody for 3 hours at room temperature. A biotinylated secondary antibody was used (Vectastain Elite). Please note Bouin's fluid was used as the fixative in this experiment. 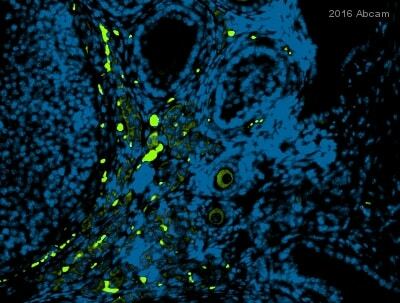 The image shows that the anti-DDX4 antibody, ab13840, stains the cytoplasm of mouse primordial germ cells when used in IHC-Fr. Additional bands at: 28 kDa, 47 kDa. We are unsure as to the identity of these extra bands. Additional bands at: 47 kDa, 52 kDa. We are unsure as to the identity of these extra bands. IHC image of DDX4/MVH staining in human testis formalin fixed paraffin embedded tissue section, performed on a Leica BondTM system using the standard protocol F. The section was pre-treated using heat mediated antigen retrieval with sodium citrate buffer (pH6, epitope retrieval solution 1) for 20 mins. The section was then incubated with ab13840, 5µg/ml, for 15 mins at room temperature and detected using an HRP conjugated compact polymer system. DAB was used as the chromogen. The section was then counterstained with haematoxylin and mounted with DPX. Publishing research using ab13840? Please let us know so that we can cite the reference in this datasheet. Does this antibody recognize others DDX family members by western blot? I also ran a blast search using the immunogen sequence and there is not significant homology with any of the other DDX family members. We guarantee this antibody to specific to DDX4. If you find this is not the case or have any issues we will provide scientific support and if we cannot get the antibody to work for you issue a credit note, refund, or replace the antibody free of charge within 12 months of purchase. Unfortunately this is something that hasnt been tested in our labs so we would not be able to give able to give you a generic answer to this question.